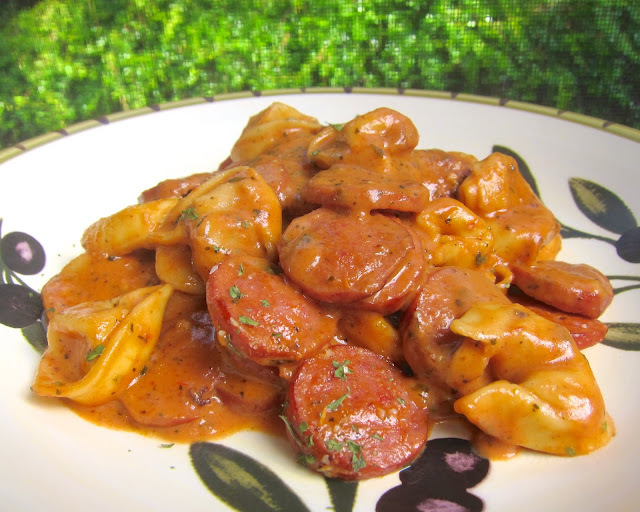 Cheesy Smoked Sausage Skillet - smoked sausage, tomato sauce, chicken broth, heavy cream, refrigerated cheese tortellini and parmesan. Everything cooks in the same pan! Even the pasta!! SO easy and super delicious! We ate this 2 nights in a row. I saw this recipe over at one of my favorite blogs, KevinandAmanda.com, and couldn't wait to give it a try! OMG! It was SO delicious! I am really into these no-boil, one-pot skillet dishes. I have made several and we have loved all of them. They are easy to clean up and take less than 30 minutes to make. Who doesn't love that?! We both absolutely LOVED this dish. There was a nice smokiness from the sausage. We actually used smoked turkey sausage, but regular smoked sausage would be great too! The sauce had a great flavor as well. I really loved the parmesan cheese in it. I wanted to eat the entire skillet by myself. I didn't; I reluctantly shared with Chicken Legs. There was enough leftover for lunch, and it was equally delicious reheated. This will definitely be going into the regular dinner rotation! In a 12-inch skillet, brown sausage in olive oil. Add garlic and cook for 30 seconds. Stir in remaining ingredients. Bring to a boil then cover and simmer on low for 12-15 minutes. It sure does look and sound delicious. It was really delicious and really easy! My favorite kind of recipe! This looks fantastic! My husband will love it with the sausage. I'm adding it to our menu for next week. Thanks for sharing! Your recipes are EXCELLENT!!! I know many just use them & don't respond. Know there are probably TONS out here who LOVE your techniques & tastes!!!! My husband refuses to eat smoked sausage so I used mild italian and I used sour cream instead of heavy cream and it was delicious! Ok that sounds good too! This is almost done on the stove now and I can't stop snitching bites. It's amazing. Thanks for another easy weeknight meal idea! You sound like me! I like to call that "quality control testing"! LOL! So glad you are enjoyed the recipe. For tomato sauce, is this just a can of reg. sauce, or a can of pasta sauce? Just wanna clarify. It is just regular tomato sauce. Enjoy! I have made this several times already, always with RAVE reviews from my hubby and 3 boys. I love a recipe that is both easy and family friendly. 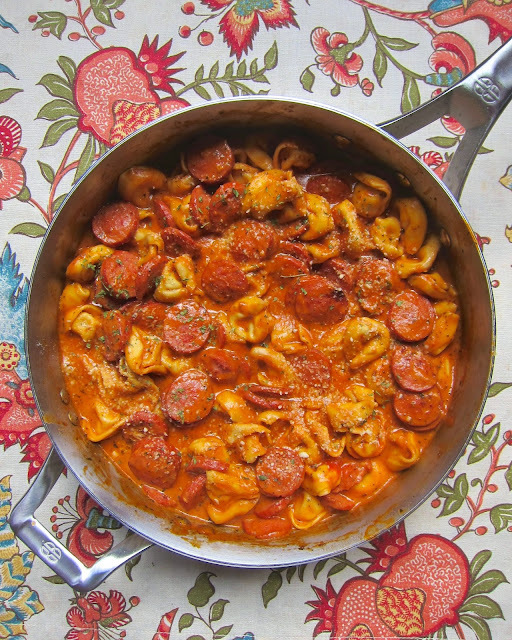 I have used a variety of filled pastas (whatever I have on hand), always turns out great! And 1 skillet, can it get any better? Thanks! This looks delicious! how many servings does this make? This is delicious! Just finished a second helping! I just made this recipe and it is delicious! You know, I'm a single Dad and had only cooked a meal several times, but seven years ago, I began making breakfast, lunch and dinner and doing so everyday. I'm 59 but am raising my 10 year old daughter, Stephanie. I am disabled and have a hard time with balance, coordination, dexterity and more. This recipe sounds as though even I would have a hard time screwing it up, thanks and I'll be sure to check out your others as well. Is the smoked sausage already cooked, suchas Hillshire Farms or do I use uncooked sausage that I cook first? Use smoked sausage, such as Hillshire Farms. Im from the Caribbean so excuse me if I sound strange but what do u eat with this recipe? And I thought those white things in the skillet is pasta. When do I add the pasta? Do I cook it like normal. Noddles. 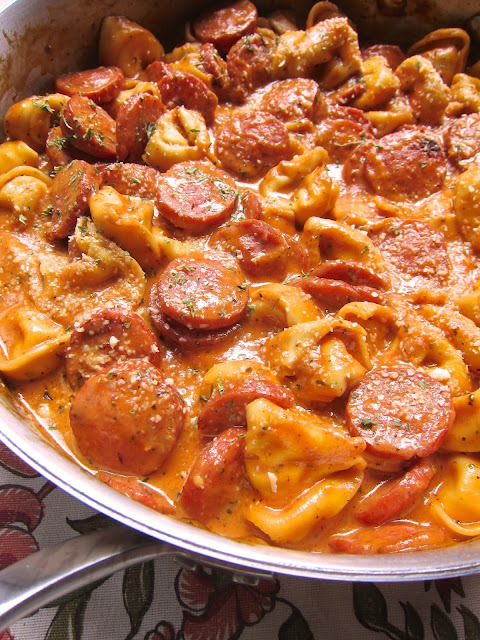 Add the pasta after you cook the sausage - with the other ingredients. It cooks in the pan with everything else. Do not precook it. Great dish. I made it after a long day at work. What's the best way to re-heat it? You can reheat it in the microwave or on the stove-top with a little extra chicken broth in the pan. Did you use real parmesan cheese or the green can? Either will work - I used the green can for this because that is what I had on hand. What type of veggie would be good with this? A simple side salad? Some green beans? Cooked this tonight, soooo yummy! I just made this for dinner tonight and it was delicious. The only downside was it was a little too salty towards the end of my bowl. I'm new at cooking. Any suggestions to help bring the saltiness down? there isn't any added salt in this dish. I would suggest using low sodium chicken broth and no-salt Italian seasoning. What kind of Italian seasoning did you use? McCormick makes a great Italian seasoning. I also really like Pampered Chef's seasoning. Whoops I posted twice sorry and thank you!! I have made this several times now...love it. My daughter asked for the recipe and it is now apart of her meal rotation too. Five stars! !